The UK election result seemed not only to be a surprise but showed the fractious state of the union. Of the 200 or so opinion polls conducted between January and May 2015 not one correctly predicted the outcome of the election. Only Richard Seymour of Lenin’s Tomb came close to an accurate estimate. The consensus among pollsters was that the Tories might win a few more seats than Labour, and perhaps 1-2% more of the popular poll, but that by either measure their advantage would be modest. Either major party could win; whichever came first would then have to form a coalition with various smaller parties. On the afternoon after the voting ended though, it seems that the Conservatives have won 6.5% more of the vote and 100 more seats in Parliament than Labour. This is, shockingly, enough to govern as a majority in their own right. In the days leading up to the election, public opinion had coalesced into two large blocs. Key to the eventual Conservative advantage was that a much higher proportion of ‘austerians’ voted Conservative. Within the Conservative-Lib Dem coalition there was a dramatic swing from Liberal Democrat to Tory, with the former losing around 48 of their 56 seats – almost all of them turning blue. Even UKIP, widely expected to steal Tory votes with its anti-immigrant and anti-EU slogans seems to have taken as many votes from Labour as from the Conservatives. Among the industrial cities of the North West and North East many have voted Labour for generations. The voters are black and migrant, public sector workers and the young. But within each group, Labour saw significant defections. Large numbers of people either did not vote at all or turned to a rival party – UKIP in the North, the Greens in London. 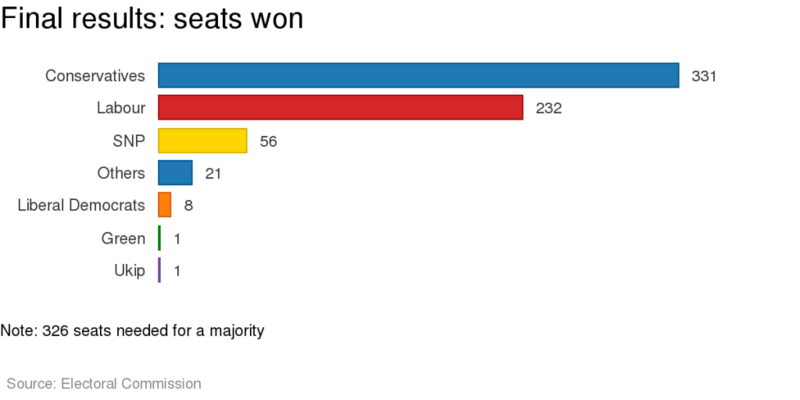 Most striking of all was the SNP victory in 56 of the 59 Scottish seats. 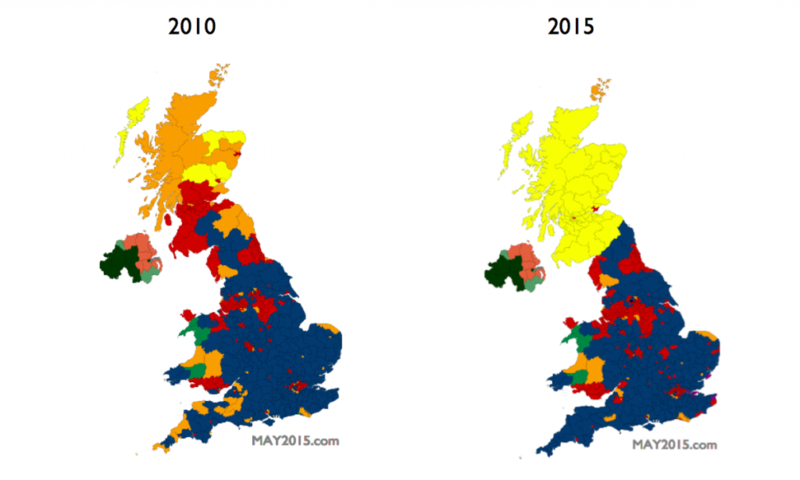 There has been a dramatic shift in opinion in working-class communities from Labour to the SNP. This is as dramatic as the one towards Labour in Britain in the 1940s, which lead to the NHS and our post-war welfare state. Leaders of three parties resigned immediately after the election: Ed Miliband of Labour, Nigel Farage UKIP and Nick Clegg of the Lib Dems. The pending Labour Party contest will see a battle for interpretation in which the most likely outcome is that Ed Miliband will be blamed for Labour’s defeat. Party critics will say that he lacked the charisma to win or that he was wrong to have inched Labour to the left after the long Blair-Brown period. If anyone wants to see how much better a Blairite candidate would have done than Miliband they only need to look to Jim Murphy. Murphy, the Blairite leader of Scottish Labour, held just 1 of Labour’s 41 seats north of the border. That said, it is almost inevitable that Labour’s coming election will lead to a lurch rightwards. This is not least because Miliband’s replacement will come from within a narrow group of senior politicians from within a Labour leadership which was generally to his right. In the days leading up to the election, the view of most people was that Cameron had led an inspiring campaign. His victories though serve only to invert the very characteristics that a few hours ago seemed most negative. There was no movement behind the Conservatives. They visited barely a small proportion of the number of homes canvassed by Labour relying instead on the support of the press, especially the Murdoch press. They enjoyed the support of individuals most associated with the phone-hacking scandal, who have escaped sanction as of yet, suggesting something of the oligarch that governs Britain. Cameron had no vision, relied on negative campaigning, and turned out his voters based on the message that any alternative government would be based on the SNP, a party he portrayed as illegitimate. Scotland will be the first crisis point of the new regime. The analysis that the SNP were set on independence, and could therefore play no part in deciding how ‘Britain’ (meaning, England) was governed proved effective in damaging Labour. Labour had loomed as the SNP’s most plausible coalition partner. But to every Scottish voter the message has equally been sent: we don’t care for your democratic opinion, the more solidly you vote against us, the less influence we will allow you to have. The promises that were told to keep Scotland on board during last year’s independence referendum were dropped immediately after Scotland had voted No. This coupled with the Tory victory in the general election point towards Scotland’s exit from the Union. It will be up to leader Nicola Sturgeon to ensure that Scotland cannot be ignored. The political scientist Peter Mair wrote two years ago that ‘the age of party democracy has passed.’ He meant that under neoliberalism, the party form has hollowed out and voters have been left isolated in relationship to the state. Democracy is diminished by this process, he argues, because it leaves a political class supremely vulnerable to lobbying by the rich and with almost no countervailing pressure. His book Ruling the Void contains on one page an especially bleak table showing the decline in party membership in various European states between 1980 and 2009: 1.5 million fewer party members in Italy, 1.1 million fewer in the UK, 970,000 fewer in France, and so on. This is the organic basis of the decline of social democracy in the same period. 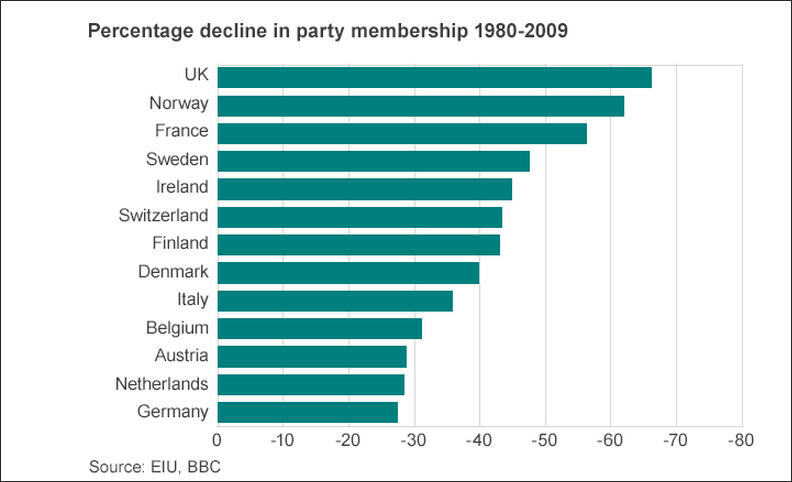 In the same years just two European countries saw a huge spike in party membership – Spain and Greece. It is surely no coincidence that these two countries have since seen a major shift towards (newer) anti-neoliberal parties, Podemos and Syriza. Britain has seen something of the same pattern. The SNP, whose membership has increased from 25,000 at the time of the referendum to well over 100,000 today, has more than 10 times more members right now than the Scottish Conservatives. The Green vote of 4% this week, a modest advance, is potentially less significant than its membership increase during the election campaign to over 60,000 members, nearly 50% larger than it was four months ago. The SNP membership surge was of course the product of a defeat in the independence vote, which required both an explanation and a countervailing action. 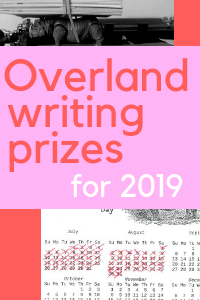 It would hardly be surprising at all if the next few weeks were to see a similar process in which the disaffected forces of Britain’s anti-austerian majority rapidly found a home, whether red or green or of any other complexion. That action against Cameron might be the silver lining to a very dark cloud. Indeed, what is notable about Greece and Spain is how quickly the post-transition political orders have unravelled under pressure of the economic crisis, suggesting an underlying fragility that contradicts the raw membership trends you note. Thanks for the thoughtful reply Tad. The SNP is of course an interesting case in that people haven’t just been joining parties in general but an anti-austerity party in particular, giving it just now a monopolistic position in terms of political representation. I certainly didn’t mean to suggest that recruitment (presumably) to PSE or PASOK followed all of this pattern, they’re not anti-austerity parties, more that it was evidence of engaged electorates which then produced something else. I appreciate that all of this was meant to be hinted at by my reference to people in these countries joining “(newer)” parties, and that was far too abbreviated. But I wanted this to be a piece principally about the UK elections even if I have been thinking towards wider dynamics. It seems to me that rapid increases in party membership must a sign of some vibrancy within civil society and that this must part of the antidote to the neoliberal hollowing out of democracy. But I accept that this relationship between civil society and party membership would be very hard to prove. I guess I see the sudden surges for formations like the SNP as a function of people wanting somewhere to go after the referendum, because (despite what Leftists keep claiming about Scotland) there is not much evidence of a significant social movement coming out of last September. The phenomenon speaks to the significance of the referendum (people thought it mattered to their social interests) alongside the weakness of direct social struggle. Interestingly, those working class areas with the biggest “yes” vote (in Glasgow) also had the lowest voter turnouts in Scotland for the Westminster election, so presumably there were a lot of people keen on #indyref but less keen on the parties trying to take advantage of it.